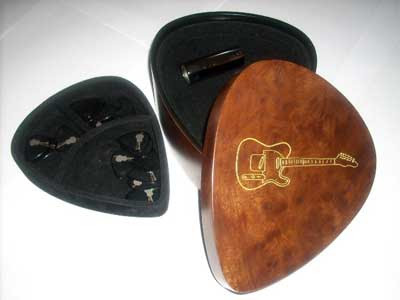 The Plectrum Box is a nice looking heavy wood (maple or rosewood) box, the shape of a plectrum and the size of an outstretched hand. Inside, it's lined with velvet like a jewellery box, with room for plectrums, slides, capos and, well, anything else that a guitarist might want to keep safe in a small box. They're not cheap - £50 for black, £65 for the nicer wood finishes - but they're a pretty good gift for an impossible-to-buy-for guitarist. I'd never put out that much cash on a cheaply fabricated item like this, and who needs a friggin' guitar graphic on a box that's already shaped like a goddamned guitar pick?!? I have something similar to hold my picks. It's smaller, has Snoopy on it, is zippered and shaped like an Easter Egg, and made of metal. It was fifty cents at a thrift shop. Being the fervent plectrum fetishist that I am, I would go for this except for the awful Telecaster graphic on the lid. The Tele is a fine guitar but C'mon! I saw the prick who supposedly 'designed' these at the London Music Show at Excel in London earlier this month. He tried to give me the 'hard sell' on these over-sized, over-priced, impractical, useless pieces of sh*t, and when I said I wasn't interested, he called me an idiot! Seriously. I nearly shoved one of his boxes up his f*cking ar*e! Guitarist have managed fine for years without such 'gimmicks' and £65?! Jesus, someone needs to tell this guy to stop cutting down trees to punt his cr*p for a fast and dirty buck. Reminds me of an old Saturday Night Live sketch: "Dude, it's got a place to stash your weed!" I absolutly love that idea because u can put ur gutair picks and lyrics that u write in it. Genus!!!!!!!!!!! !